Most of us are familiar with the strange, moon-like lotus flowers that bloom every summer on the west side of Echo Park Lake. They are a luminous part of the history and lore of the neighborhood, inspiring the annual Lotus Festival and gracing the health-goddess mural by Ricardo Mendoza at the corner of Echo Park Avenue and Sunset. Many of us, however, are not aware that the flowers of the South Asian lotus, Nelumbo nucifera, are sacred to millions around the world. For thousands of years, Hindus as well as Buddhists of Tibet, China and India have considered the aquatic lotus flower sacred (and many find the roots quite tasty). Lakshmi, the Hindu goddess of fortune and prosperity, is portrayed sitting on a huge lotus, and images of lotus flowers often adorn Buddhist temples and altars. As befits a mythic flower, no one is completely sure by whom Echo Park Lake’s lotus bed was planted, and there has long been confusion in news accounts of what kind of plant it is exactly. In a Los Angeles Times news story dated Oct. 26, 1889, it is reported that J.C. Harvey will donate for the parks some Egyptian lotus from the Nile,” though the story does not say where the lotus would be planted. In L.A. Times stories of the late 20s and early 30s the lotus of Echo Park Lake are frequently referred to as Egyptian lotus – which also have a rich history in human imagery – and as water lilies. Michael O’Brien, landscape architect and certified arborist, says that the lotus of Echo Park Lake are not the same as the Egyptian plants and are not water lilies. “Nelumbo nucifera,” he says, “is native to South Asia to Australia and is grown in tropical climates around the world. As to where these plants came from, the source is lost in the mists of time. The Egyptian lotus is N. caerulea,” a different kind of plant. One of the most popular legends about the lotus is that they were planted by Angeles Temple missionaries who brought back seeds from China. This story has never been proved. Though some have claimed Echo Park’s lotus bed to be the largest outside of Asia, there are said to be larger stands in the Carolinas, Hawaii and possibly Florida. 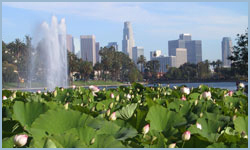 Echo Park’s lotus stand, however, is undoubtedly the largest in the western United States.